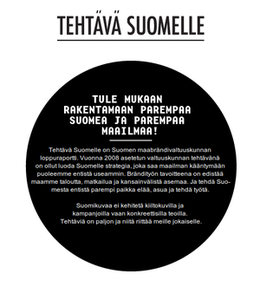 Finland's national brand strategy project released their report today on the Tehtävä Suomelle website. The basic idea is to promote the Finnish capability for getting things done, and the communal approach to problem solving. This statement sparked a revolution. The amateur computer programmer Linus Torvalds had come up with a way of enabling an unlimited number of people to work on the development of the same program source code. This was to prove to be a highly successful approach. Linux, which since then has evolved into a huge success, is one of the most significant open-source operating systems. The Internet would not be possible without a service infrastructure, which is currently largely based on Linux and open source. Torvalds understood that a complex system, such as a global network, can only function if there are a large number of motivated individuals contributing to its development. This is expressed in another famous statement made by Torvalds: "Given enough eyeballs, any bugs are shallow". In other words, the difficulty of problems depends on the number of people involved in finding a solution. 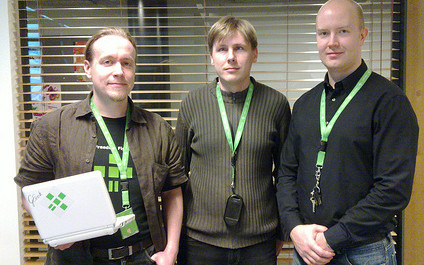 Linux, which was created by Torvalds, and other open source systems combine the foremost virtues of Finnish functionality: nurturing the commons in a successful way, and the shrewd use of human resources. Thus it is probably no coincidence that the main impetus for open source came from Finland, from a country where functionality is the highest praise for almost anything. I would imagine this is the first time a country uses FOSS philosophy as one of the building blocks for a national strategy. If you have the time, go to the project website and read the materials. They seem to have some interesting suggestions on how to move Finland's public image forward.